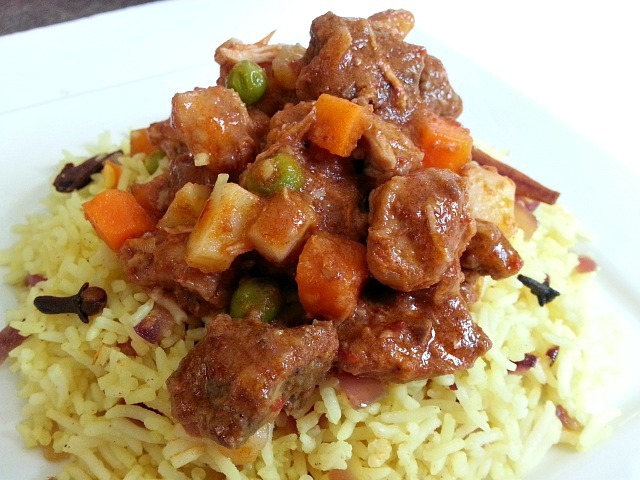 The Goan Beef Stew is something of a misleading name, as it’s a trilogy of 3 meats. Beef, Pork and Chicken. Since cold weather calls for a bowl of hot stew, one thing I can say for sure it’s not a typical American stew. It has a great balance of spice and flavors without one overpowering the other and if you like Indian foods that are not too spicy then this should definitely be on your list. While researching for the recipe I found out that my mother and mother-in-law had two different variations on the same recipe and checking online I realized every household has their own version. 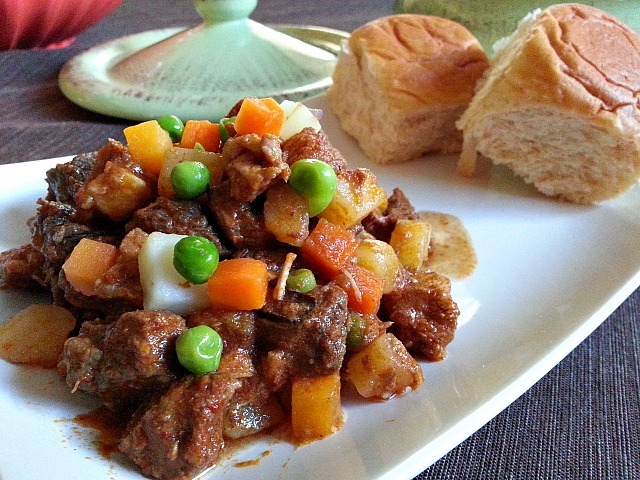 While there are in total of 4 variations I am sharing with you my mother’s recipe of the Goan Beef Stew that I grew up feasting as it is a staple for all feast’s. Feast’s in Goa are special day dedicated to a saint, Mother Mary or Jesus. You can read more here. This recipe does take extra time to make but it is well worth the wait. Plus you can cook it a day or two ahead. 1. 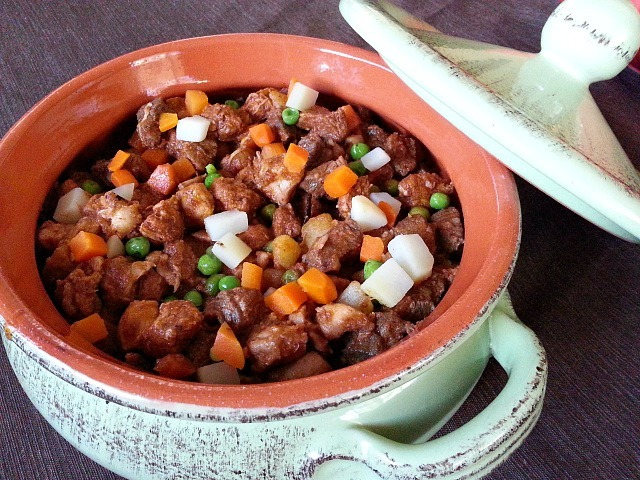 The stew is made with just beef and chicken. 2. All 3 meats including Goan pork sausage is used. 3. Some cases milk is added for a creamy gravy. Do note it may go bad if the food is left out for a long period. 4. 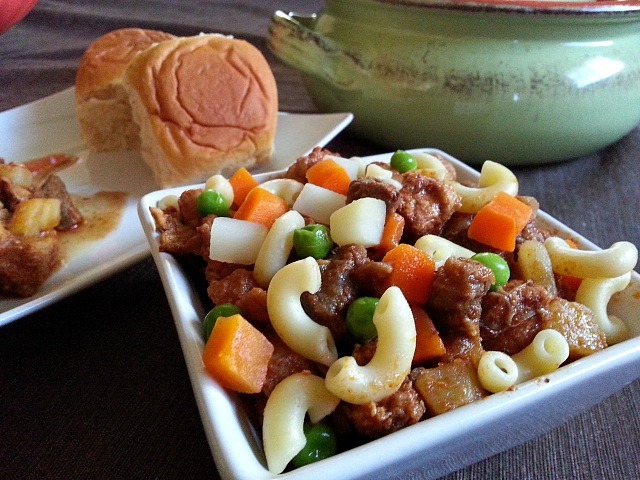 Macaroni is added to the stew. My recipe is using the listed 3 meats and marinating the pork meat with some spices overnight or for at-least a few hours. 12oz of frozen peas and carrots. Wash all the meats. 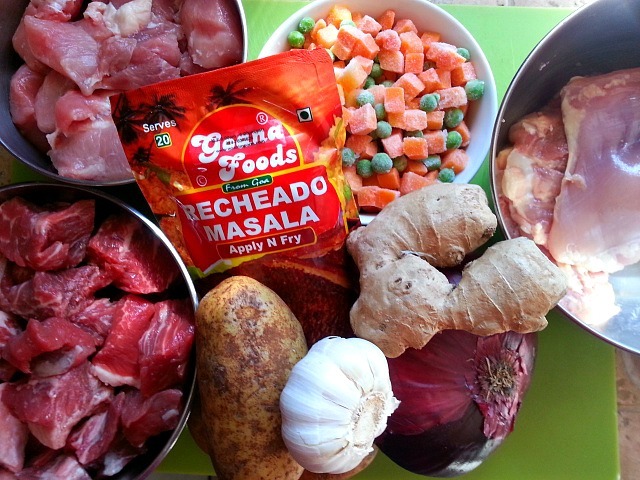 Apply salt and 2 tbsp of recheado masala to the pork and marinate for 1-2 hrs or overnight. Add the grated ginger-garlic to the beef and salt. Next apply salt to the chicken and keep aside. Par boil the potatoes for about 6-8 minutes. Steam the peas and carrots according to the packet instructions. Keep aside. In a hot pot add oil, cloves and cinnamon till the oil smells. Add the onions and saute till translucent. Next add the beef saute and cook covered for 15 minutes on medium heat and check occasionally. Next add the pork and chicken and cook for another 30 minutes while checking on the meats. Cook covered, season with salt if required. Once done take of heat. Heat up another pot and skim the fat from the stew and saute the boiled diced potatoes in the seasoned fat (my mom says it flavors the boiled potatoes) and saute for 3-5 minutes in the same oil. Next add the cooked stew, peas and carrots and saute for another 3-5 minutes till the gravy thickens. Once’s done add your cooked macaroni now and if required 1/2 cup of cold whole milk and bring it to a quick boil. Serve with Pulao Rice or some nice hot crusty bread. If leftover re-heat. I like how you served it alone, with rice, then with macaroni. This sounds so yummy. Thank you for sharing. Thank you also for visiting my blog. I certainly appreciate it. This looks warming going into winter here– I know what you mean about every family having their own version of standard recipes. It seems like you own mom’s version always tastes the best! So true Rhonda, for every child their mom’s cooking is always the best :-). And since I stay so far away I don’t get to enjoy her cooking often, only when we make make the 24 hrs flight back to visit. This sounds amazing will have to try soon for sure! I love learning about traditional cooking in different places. All these recipes look incredible….and I’m so happy you’re sharing! 😊 yum yum yum ! This is certainly worth trying! Wow! I’m falling for Goan food. This one looks amazing. The funny thing is, Goan food is so similar to Dominican food that looking at it I almost feel like I’m looking at Dominican food! Thanks Arturo for your kind words. I think wherever there were Portuguese and Spanish influences the foods are very similar to each other in names and in cooking styles. Thank You Barbara so much. Hugs back to you as well :-).